September 21st is the day the United Nations General Assembly decreed shall be set aside as the International day of Peace, or World Peace Day. “Let us all work together to help all human beings achieve dignity and equality; to build a greener planet; and to make sure no one is left behind,” said UN Secretary-General Ban Ki-moon. And somebody important rings a bell, choirs sing anthems, media publish pictures of doves, and bishops and popes light candles. What’s the point, exactly? It’s not as if those hell-bent on war will stop bombing aid convoys, or those determined to impose their idea of peace on others will stop their torture of infidels and genocides of hate. After all, if your god has decreed holy war, who are you to interfere with the divine plan? What exactly do you do to stop those who dispute your apprehension of dignity? What if you demur from some UN-imposed notion of equality? What’s the point of beating swords into ploughshares when the fields are full of landmines? 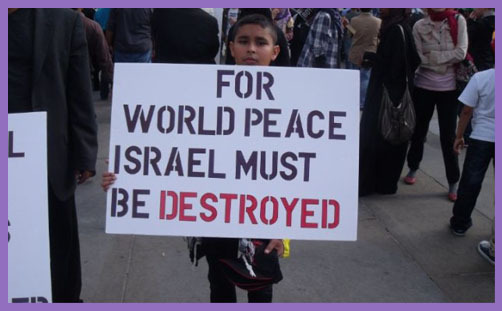 Pray for the peace of Jerusalem: they shall prosper that love thee (Ps 122:6). If peace is the absence of war and conflict, there will never be a World Peace Day until the Prince of Peace reigns, the law is perfect, and the government is upon his shoulder. There will be no man-made peace until man stops demanding and commanding: world days dedicated to vacuous abstracts and nebulous notions console no-one. Or maybe they console, but they don’t work. We can gather in our communities and meditate on our precepts, but witnessing for peace is a bit hollow while we’re flogging fighter jets to Saudi Arabia and arming the mountains with nuclear missiles. Blessed are the peacemakers? It’s a prophetic vision, quite unworkable when Islamists are just as adept at beheading you with a ploughshare as a sword. Doesn’t world peace rather depend on a common notion justice? Isn’t common justice contingent on a universal apprehension of righteousness? Where’s that going to come from if not Zion? Who will unite the people if not the Messiah? Should not a World Day of Righteousness precede a World Day of Peace? And he shall judge among the nations, and shall rebuke many people: and they shall beat their swords into plowshares, and their spears into pruninghooks: nation shall not lift up sword against nation, neither shall they learn war any more (Isa 2:2-4). And a man’s foes shall be they of his own household (Mt 10:34-36). Pray for peace, by all means. Light a candle, ring a bell, if you will. But don’t beat your swords into ploughshares just yet, for the only safe farmers are those which are guarded day and night by the swords of the legions.